Do you have honeybees in an unwanted location? Please read further before calling. Are you sure it's a Honeybee? Read our Swarm Help guide to verify before calling us. 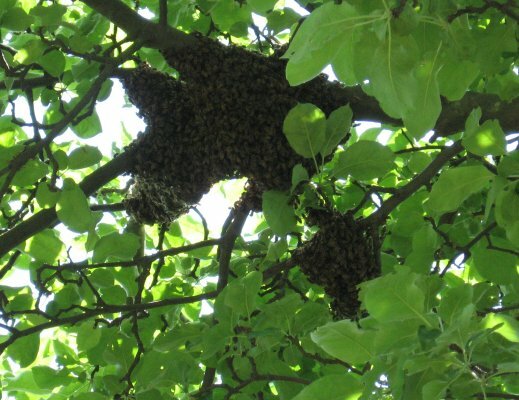 Swarms of honeybees (a cluster of bees outside their home, hanging on a tree or bush or something) appear most often in March-July but occasionally at other times of the year. These bees are attempting to find a new home to move into -- maybe your garage or attic. A swarm represents free bees to beekeepers and anyone on the list below would be interested in capturing them. Please be prepared to answer the questions below when you call, and pick a beekeeper in your general area. A swarm that is not captured will colonize lots of places that are inconvenient to humans. If honeybees have moved into your structure we might be able to remove them for you. Some beekeepers charge a nominal fee for removing bees from structures. Please be prepared to answer the following questions when you contact a beekeeper. Are you sure it's a Honeybee? Check out this Identification guide . Other types of bumblebees, hornets and yellowjackets can look similar, but we can't help with those critters. You'll need a pest control company for that. If it's a swarm, are you sure it's still there? 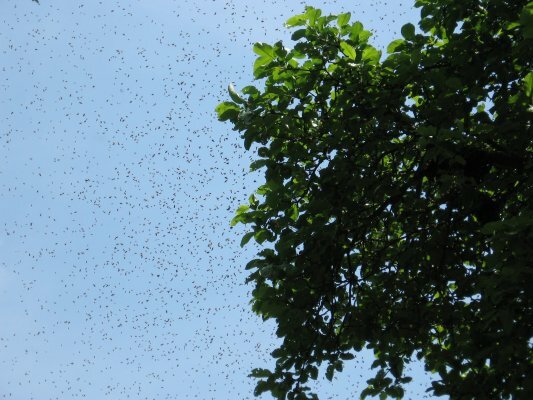 Swarms can pause for a few minutes to maybe 36 hours; when the scouts find a good home the swarm will be gone. If it's a swarm, how high up off the ground is it? Be honest, tell us if it's 50 feet up in your oak tree. If it's in a structure, how high up is the entrance?